Our Stolen Future: Are falling rates of non-Hodgkin's lymphoma due to chemical bans from the 1970s? 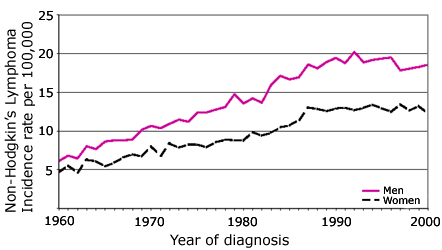 As in most western countries, non-Hodgkin's lymphoma (NHL) increased in Sweden during much of the second half of the 20th century. By the final decade, however, trends had reversed, with NHL falling slightly. Right: NHL incidence in Sweden; adapted from Hardell and Eriksson 2003. Data in the SEER registry for men in the US are consistent with the Swedish trend, with steady increases in the incidence rates from 1973-1990 (+ 3.6% per year), a slower increase from 1990-1995 (+ 1.6% per year) and a decline from 1995-1999 (0.9% per year). In this paper Hardell and Eriksson propose that the recent decline may be the result of reduced exposures to several pesticides and persistent organic pollutants that studies have associated with elevated risk of NHL. Their argument is based on several inter-related observations. Because the delay between when NHL begins and when it is diagnosed is usually years if not decades, if the observed decline in NHL cases is due to changes in environmental conditions, those changes would have begun several decades ago. NHL risk is firmly linked to impaired immune function. Several types of chemical exposures have been consistently linked to elevation in NHL risk. The chemicals involved suppress immune function. A striking example of this was published in 1997, showing an interaction between PCBs and Epstein-Barr virus in elevating risk to NHL. Those exposures have declined over the past few decades because of government policies restricting or banning certain compounds. What do they find? Hardell and Eriksson pull together two decades of their own and others' research on NHL that has consistently revealed associations between NHL risk and exposure to a series of contaminants. They briefly review scientific findings that link NHL to 4 types of exposures affecting the immune system: chlorophenols (e.g., the pesticides 2,4-D and 2,4,5-T), organic solvents, persistent organic pollutants (PCBs and dioxins) and HIV virus. Exposures to the chemicals have decreased since the 1970s; in Sweden, HIV exposure is low and stable. They then ask the following: if these associations are causal, how many cases could have been avoided by elimination of the exposures? They do this by focusing on the percentage of NHL cases that are plausibly caused by one chemical exposure or another, called "the attributable fraction." These fractions typically are low, running from 3% (chlorophenols) to 25% (persistent organochlorines). But even at the lower range, they indicate, for example, that 30 cases of NHL out of 1000 could have been avoided by avoiding exposures to chlorophenols. For the persistent organic pollutants, that number is 250 out of 1,000 cases that could have been avoided, according to their calculations. According to Swedish and other data, the highest human exposures to persistent organic pollutants occurred during the 1970s, just before bans began to be implemented. Exposures have decreased since, with the pace of decline varying depending upon when and where restrictions and bans were implemented. In Hardell and Ericksson's estimation, known decreases in the body burdens of several of the chemicals implicated in causing NHL have decreased sufficiently so that, if the chemicals actually have caused NHL, then we should be witnessing a reversal in the decades-long rise in NHL incidence. The graph above shows that it is. What does it mean? If this is true, it's good news, because it means that for at least one cancer, we are beginning to win the war... not via the focus on cures pursued by the health establishment for decades with at best mixed success, but instead through prevention. Decades of hard work to design and implement better chemical regulations will have bourn fruit. And new public health measures, like the 2001 Stockholm Convention on Persistent Organic Pollutants, should add momentum to efforts at cancer prevention. The data and reasoning presented by Hardell and Ericksson fall far short of proving their theory. They make a plausible case, however, that opens up a broad new front in arguments about the costs and benefits of reducing exposures.